Oh yes, please strip away the mystery. Really enjoyed this article. Plan on reading it again, and then maybe one more time just to make certain the meaning sinks in. 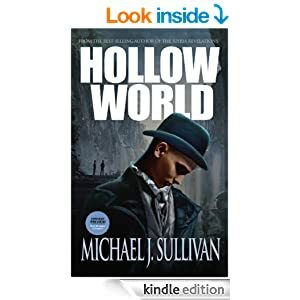 Michael J. Sullivan, author of HOLLOW WORLD gives some excellent advice for indies as well. Run a Giveaway – Sullivan gives away advanced reader copies (ARCs) of his books on Goodreads up to 6 months before the book is available in print. This gives the books more value to contest winners who read them before the general public. “I was only giving away two copies but 2,700 people entered and I got the member names for all of them,” Sullivan told me. In addition, each contest entry generated a story on that person’s activity feed on Goodreads, which became free advertising for the book. Build a List – In Sullivan’s world, building readers can be a one on one chore, but the numbers add up quickly. “I used to go to malls and stand in a bookstore for an event for three hours and I’d get 5 people to read my book. But then they’d write back to me and some of them would become fans and recommend my books.” Goodreads makes the same process much easier. Participate in The Community – Sullivan stresses a central point about communities – they treat others in the community best. The secret to being promoted within a community like Goodreads is being a good citizen and participating not just as an author but as a reader. Sullivan was also one of the first authors to friend virtually every reader who gave his books positive ratings. As a result he now has over 51,000 reviews of his books on Goodreads.